The North African term of « tajine » can be misleading at times, even though its most populirized definition is that of the Moroccan cone-like claypot in which meat and vegetables are slowly cooked……it has actually a wider meaning that changes from region and country to another . Algeria, being a vast country……the cuisine and the culinary lexicon is far from being homogenious….. while the west regions and some of the central parts have the same definition od tajine as the neighbouring Morroco , the eastern parts tajine diffrentiates it self by being a sort of fritata in which cooked meat, eggs, cheese and vegy are blended and baked……. 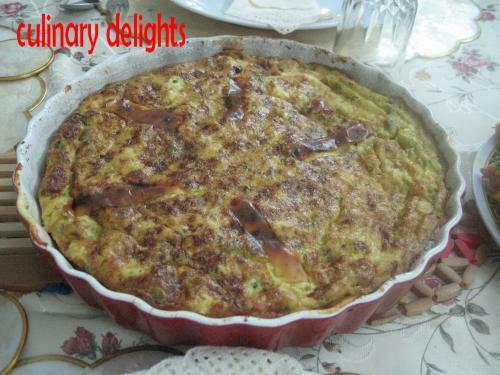 Being from the Easten region of Algeria , I would like to shed the light on my own understanding of tajine….this » gratin » like dish that reminds me of my childhood, ramadan Iftar tables and lazy summer lunchs where cooked meat, vegy, egg, and generous portions of cheesed are blended together , popped into oven and enjoyed with the most hearty bread and the best mediterranean salads……. 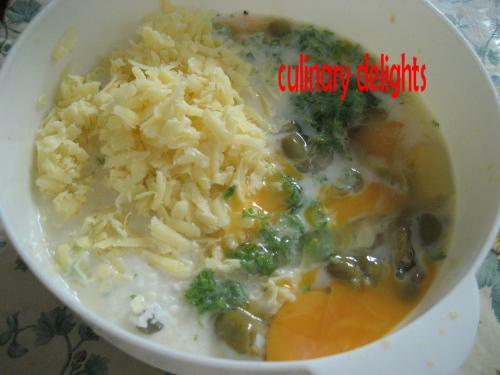 optional : vegetables of your choice : 1 potato diced into cubes then fried, grilled pepper , cut into cubes, fresh mashrooms fried with a knob of butter , a pinch of salt, pepper and a tbs of chopped parsley..etc……. Start by browning the chicken with onions, spices and ghee/butter for few minutes, cover with hot water and let it simmer for 30 mn until the chicken is tender and the gravy reduced to half. allow to cool , then shred the chicken, pour back into the gravy pan , add in the rest of ingredients. lightly beat until you get a smooth and a well blended mixture. if you want to bake it the classical version, i.e without the puff pastry base, greese a pyrex dish, put it few minutes in the oven until it gets hot ( this will help you cut the tajine easily and clean the dish without much fuss ) pour over the tajine mixture, sprinkle some additional cheese on top and bake for 20 to 30 mn until firm to touch in centre. if you like my puff pastry version, line a cheese cake mould with parchement paper, greese the sides of the mould gently lay the puffpastry sheet into the mould .If possible, chill the the crust before filling and baking. 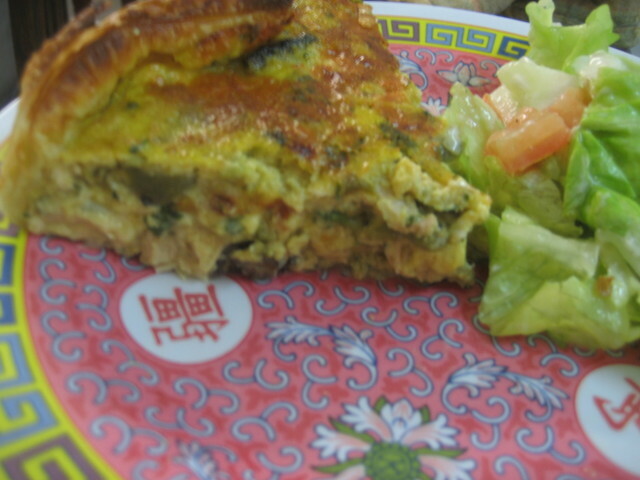 pour the tajine mixture and bake until golden brown and firm in the centre. faire revenir le morceau de poulet coupe’ en 4, avec le smen et les epices, couvrir d’eau et laisser cuire. une fois le poulet cuit et la sauce reduite . emietter et le retourner ala sauce . entre temps, melanger ensenble,oeufs, chapelure, lait, les deux fromage, persil et olives, battre le tout a l’aide d’une fourchette, ajouter au melange, sauce/ poulet . 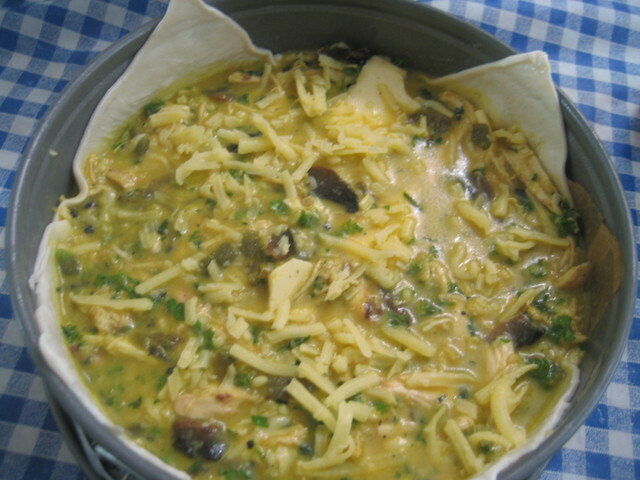 huiler ou beurrer copieusement votre moule, le faire chauffer quelques minutes au four ( pour faciliter le demoulage du tajine et le lavage du moule), versez-y la preparation et enfourner pd une vingtaine/trentaine de minutes. le tajine sera cuit quand la surface est bien dore’ et un couteau incere’ a l’interieur sortira sec sans aucune trace de liquide. 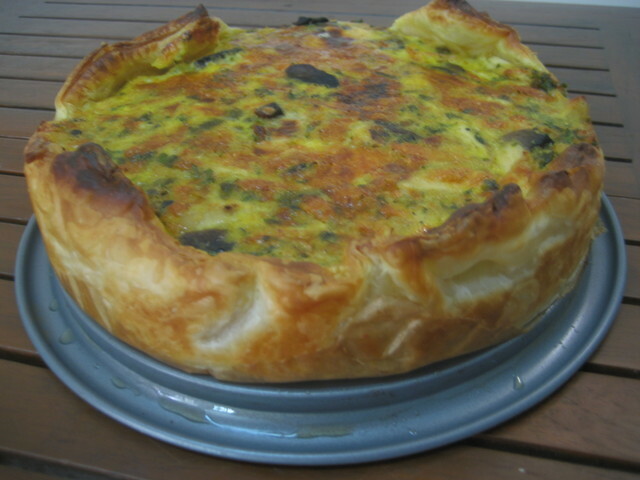 pour reproduire ma version » quiche-tajine » , il suffit de prendre un moule a charniere ou a manque’. le tapisser de papier sulfurise’ pour faciliter le demoulage , huiler les parois du moule, foncer – y une pate feuilletee’. remettre au frais, puis verser le melange ci-dessus. faites cuire dans un four chaud jusqu’a ce qu’ un couteau incere’ sortira sec.